You don’t have to sport a green thumb to grow chives (allium schoenoprasum), they are almost a fail-proof crop and will build up your confidence to grow a variety of herbs. Chives, a relative to the onion, are hardy, drought tolerant perennials. They grow to be 8-20 inches high in mounds via underground bulbs. 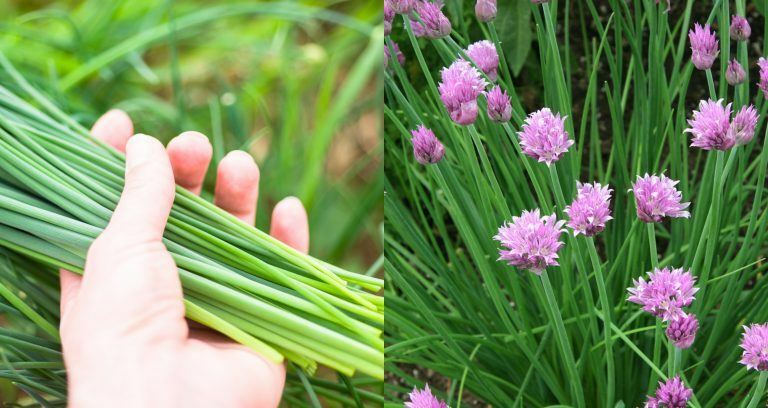 Not only are chives pretty with their dainty purple blossoms and thin green hollow stalks, but they are amazingly delicious. What’s more, the entire plant including the leaves, blossoms, and even bulbs are edible. Chives have a delicate, not overpowering onion flavor, and hollow green leaves that are so versatile in the kitchen they go with soups, salads, omelets or anything that needs just a touch of garlic flavor and a pretty accent. I have always planted chives throughout my gardens, in with my wildflowers, as borders in beds, in my veggie garden and also in contains on my decks and patios and even inside in a sunny window. They are so flexible and happy really anywhere that you put them as long as there is at least half a day of sunshine. Chives are super easy to start from seed. Start them indoors 10-12 weeks before the last suspected frost. This is because although they germinate quickly, chives grow slowly so you want to give them enough time to get going before it is time to put them outdoors. Fill flats with a soilless peat-based mix. Sow 10-15 organic seeds per cell ½ inch deep and keep the flat consistently moist and at about 60-70 degrees F. Chives will germinate in seven days or so. In early spring, harden your chives and plant outdoors in a sunny area. Chives prefer soil that is moist, organic, rich and drains well. Before planting, work 6 inches of composted organic matter into the soil. Add 3 tablespoons of organic fertilizer per square foot of planting area. Space plants 4 to 15 inches apart and don’t let the soil dry out until plants mature. You can also start chives directly from seed outdoors. Be sure to prepare the bed area as noted above. You can harvest chives about three months, as long as the plant is at least six inches tall. I like to just leave the chives in the ground and snip the tops as needed. Chives are hardy and vigorous and will come back even if you trim them all the way to the ground. Use clean garden shears or scissors to clip the leaves, about two inches above the soil. Be sure to clip leaves from the outer portion of the plant first and don’t clip all the plant at one time. Use clean garden shears or scissors to clip the flower at the base of the stem. Chives will blossom between May and June. As mentioned, chives will pop up year after year. Perennial plants are a wonderful addition to any garden and no work after the first year. Growing chives close to other plants can help keep pests at bay, assist with pollination, improve soil and increase yields. Here are some plants that benefit from having chives planted close by. Chive blossoms attract beneficial insects to your garden. Pollinators such as bees, butterflies, and wasps are attracted to the vibrant purple blossoms. Depending on where you live, finding deer resistant plants might be difficult. Chives are one of those good old favorite plants that will bring much value to your garden without drawing deer. Chives contain compounds that provide health benefits similar to garlic. As such, they can help relieve digestive problems. They contain a natural antibacterial quality that eliminates a number of dangerous bacteria such as those in the salmonella family. Chives can also increase how efficiently your gut uptakes nutrients. The high levels of vitamin C in chives encourage white blood cell production, the powerhouse of your immune system. Be sure to enjoy plenty of chives during cold and flu season. Allicin is an important organic compound in chives which has been shown to reduce levels of LDL and lead to a healthier heart. Allicin has also been found to lower blood pressure. Chives also contain quercetin, a powerful plaque buster that also reduces cholesterol. This helps prevent atherosclerosis and lower the risk of heart attacks and stroke. Chives contain vitamin K which is necessary for bone density and bone integrity. Vitamin K is not found in many common foods and is very important to consume as we lose bone mineral density with age. Loss of bone density is the leading cause of conditions like osteoporosis and the exacerbation of inflammatory conditions including arthritis. Research has demonstrated that quercetin, contained in chives, may prevent certain types of cancer including prostate, colon, breast, lungs, and ovaries. Vitamin C and vitamin K – also in chives, can help battle the free radicals that can encourage the spread of cancerous cells. In addition, chives also contain Zeaxanthin and lutein, two more antioxidants that are connected to lower likelihood of getting oral cancers. Chives can help detoxify the body mainly because they have slightly diuretic properties. This, combined with their free-radical fighting and antibacterial properties, helps boost the detox ability of chives. They stimulate urination which helps the body get rid of toxins, water, salt and even fat. With age there is an increased risk of macular degeneration and cataracts. Chives reduce oxidative stress and promote eye health.